After a wonderful month in Jerusalem, we're back home. We hope you enjoyed the posts that focused on Passover, Israeli holidays, Israeli music and dance and food. We'll be back with more of that as part of our mix, but it's time to get back to our roots -- Jewish humor. What better way than to revisit some of the classic comedy routines by Jewish comedians (are there any other kind?). Many of us know Woody Allen as an actor, producer, and director, but don't remember his origins as a standup comedian. 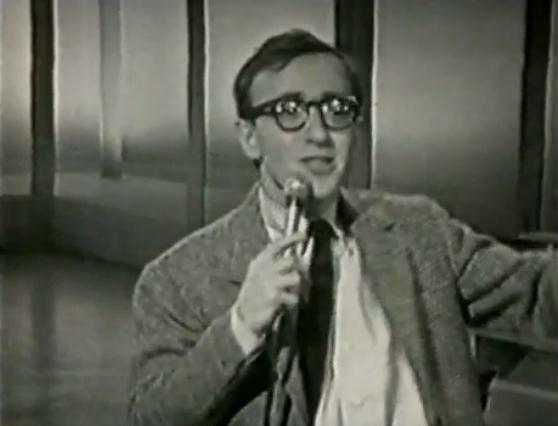 We discovered this rare video of Woody performing one of his routines in 1965. Not only is this a classic ten minutes of nonstop comedy, but it includes one of his most famous routines, telling of how he shot a moose. It starts at seven minutes into the routine, and is really worth watching. A true genius! Thank you! Saw him years ago at the Bitter End in NYC--brilliant then and still the same.